Jerry Lambert traveled to North Philadelphia from Bucks County to protest the anti-Trump protest outside Donald Trump's roundtable event at Greater Exodus Baptist Church on Friday, Sept. 2, 2016. Donald Trump came to North Philadelphia on Friday afternoon for a roundtable meeting with leaders within the city’s African American community. Hundreds of protestors waited outside for him along a stretch of North Broad Street that featured much police and media presence, but cars weren’t blocked from passing by. 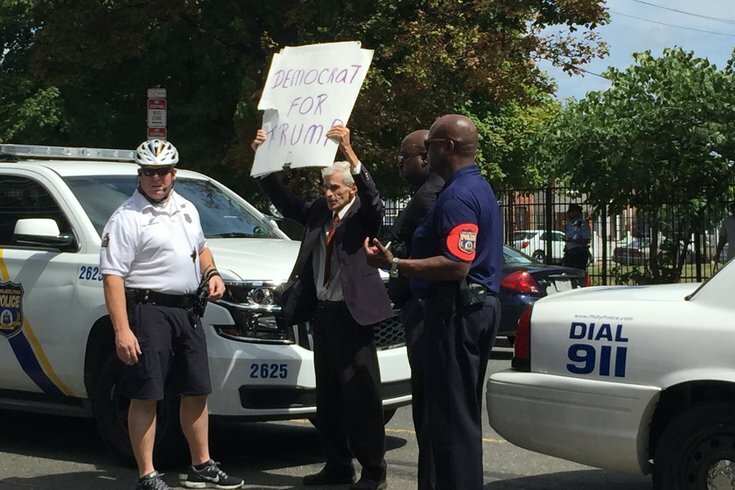 That anticipated scene prompted 71-year-old Jerry Lambert to travel into town from his Bucks County home – toting signs that read “Democrats for Trump,” “Jail Putin” and “I Love Walls” – to exercise his First Amendment right to counter-protest. There – donning a dark suit with white dress shirt and red, patterned tie – he found himself amongst opposite-minded folks who had come to tell the Republican presidential candidate he wasn’t welcome here, as far as they were concerned. It had all the makings of a Friday afternoon fracas, and when Lambert walked into the opposing crowd at 1:05 p.m., that’s exactly what temporarily ensued. When he approached Black Lives Matters’ Asa Khalif – he who had draped a Klan hood over the Frank Rizzo statue a couple weeks back – the latter ripped the signs out of Lambert’s hand and threw them to the ground in the intersection of North Broad and Brown streets. That prompted a melee that saw police intervention but no punches thrown or shoves leveled. Lambert scrambled to pick his signs off the ground, claiming he’d been attacked. Officers with the civil-affairs unit then escorted Lambert away from the crowd. They gently explained that he’d really put himself in a dicey situation by not giving himself a little distance from which he could be heard. The officer, after working out a place where Lambert could safely protest, told him that “Sir, I saw two people in the midst of a scuffle” as Lambert again raised his “I Love Walls sign” defiantly. Before heading over into the middle of the street where he’d be joined by another likeminded protestor – Rich, from Manayunk, who’d just gotten off the subway and randomly found his way here – he told the assembled press his side of the story. Then, he was asked if his Walls sign was symbolic of supporting the candidate who would arrive, down the block behind a motorcade and wall of bicycle officers. Within a few minutes, and outside of Lambert’s earshot, Lt. John Stanford – commanding officer of public affairs/social media – noted that officers “broke it up and didn’t see anything that warranted an arrest.” He left the door open for arrests if officers witnessed anything that warranted it, though. 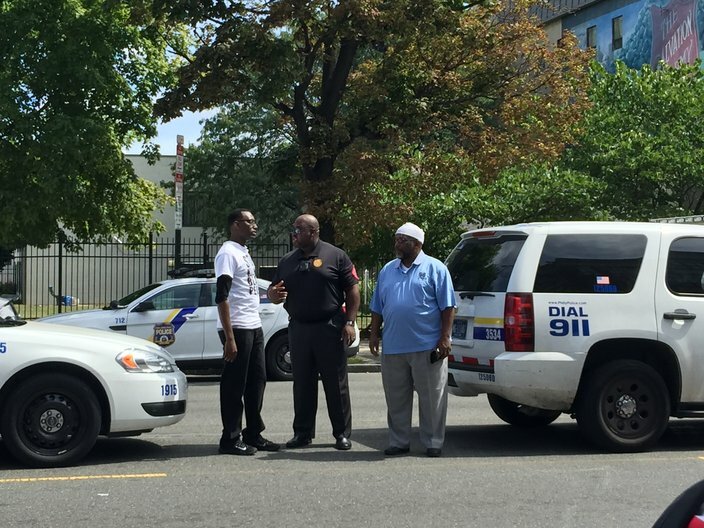 Black Lives Matters' Asa Khalif, left, talks with Philadelphia Police about the incident that saw him remove a counter-protestor's sign from his hands and throw it to the ground. From there, the protests continued loudly and enthusiastically, even after Trump entered a door at People for People, Inc., an offshoot of Rev. Herbert Lusk’s Greater Exodus Baptist Church. Khalif said he’s happy that he’s matured as a protestor, because in previous years, that scene could’ve gotten hairier. Asked if he regretted coming out, “I love to come out and exercise my First Amendment rights” was his response. Then, he was asked if he’d been hurt at all in the melee.